Walking through a dim forest at twilight, you hear a strange sound, shortly followed by booming howls, odd tree knocks, and rustling leaves… Does curiosity get the better of you, or do you brush it off and head home (aka bolt in the opposite direction)? Yeah, most of us would turn tail and run for safety, and rightly so, but throw a bigfoot enthusiast into this spooky situation, and they would bust out their cameras, audio recorders, and thermal scanners to collect evidence of this covert cryptid (a creature whose existence is disputed). Whether you’d dash away or opt to stay — as long as you have an interest in the elusive bigfoot — you’re welcome to attend the Smoky Mountain Bigfoot Conference in Gatlinburg, TN! Held at the Gatlinburg Convention Center on July 27 from 9AM – 5PM, this will be the very first bigfoot conference in the Great Smoky Mountains. Even Congressman Tim Burchett, a known sasquatch supporter, has been invited to this exciting event. Join fellow bigfoot believers and skeptics and listen to top researchers and investigators as they present their findings and chat about bigfoot encounters. Look forward to sasquatch speakers, including NAWAC (North American Wood Ape Conservancy) researcher Matt Pruitt, NABS (North American Bigfoot Search) author Scott Carpenter, Bigfoot 911’s John Bruner, and East Tennessee Bigfoot Organization founder Matt Seeber. While listening to their expertise and spine-tingling stories will no doubt be captivating, the most notable guest speaker will be Cliff Barackman, co-host on Animal Planet’s Finding Bigfoot series and avid North American bigfoot researcher with one of the largest collections of bigfoot casts in the nation. Mind already racing with curious questions? Jot them down and let them loose for the Q&A segments after each guest. Remain focused for round 2 of the Bigfoot Conference by refueling and recharging at lunch, which will be 1 hour mid-event. Chow down on your pre-ordered boxed lunch or venture onto the streets of downtown Gatlinburg for a quick and tasty bite. There will also be an all-day, snack-filled concession stand on site as no outside food or drinks will be allowed at the venue. Should you opt for the boxed lunch, pre-ordered at $15 (in addition to your ticket purchase), you will have 4 delectable choices. All but the salad come with your choice side: potato salad or chips. If you decide to dine out for lunch, dash to a close restaurant as there will only be 1 hour allotted to eat before the conference continues (with or without you). Not to worry, there are great options only a hop, skip, and a jump away! The Smoky Mountain Bigfoot Conference is open to the public, with (non-refundable) tickets purchased in advance. General admission is only $25 and will guarantee you an open seat between rows 10-40. You can even pre-order an official event T-shirt online for $20 (picked up at the event info booth) to commemorate your attendance at one of the biggest bigfoot conferences ever held in the southeastern United States! Thinking about waiting a bit longer before biting the buying bullet? We advise against it as VIP seating is already sold out — plus, ticket holders may have the opportunity to hike the Smokies with Cliff Barackman! Got intriguing bigfoot merch to sell? Set up a 10×10 vendor booth space for $100. Looking to sponsor? Spend $250 for stage and social media mentions, a small logo on the stage banner, 2 admission tickets, and 2 event T-shirts. Offer $500, and you’ll get a prime booth space, stage and social media mentions, a small logo on the stage banner, 4 admission tickets, and 4 event tees. Whether you’re attending the conference with a coworker, friend, or your entire squatchin’ crew, Cabins for YOU has everything you’re looking for in a Smoky Mountain vacation rental. Ranging from 1-16 bedrooms, we have small cabins for 2 to large lodges for 50+. On top of homey conveniences (Wi-Fi, full kitchen, king-size beds, etc.) 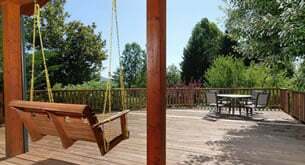 and entertaining amenities (from a private pool to a home theater to a game room), you’ll appreciate a convenient Gatlinburg or nearby Pigeon Forge location to and from the conference center. Speak with your personal Vacation Specialist at 1-800-684-7865 or fill out our Options for YOU form and start planning your trip to attend the bigfoot conference today. Lace up your squatchin’ boots and head to Gatlinburg, TN — for the first ever Smoky Mountain Bigfoot Conference this summer!